The Whitney Awards finalists were recently announced. For those of you who've never heard of them before, don't be too ashamed; I only heard about them last year for the first time. The Whitney Awards are given annually to LDS authors in several categories - all fiction - and are appropriately named after Elder Orson F. Whitney, who was an apostle in the early Church. His declaration that Latter-day Saints "will yet have Miltons and Shakespeares of our own" has been both aspirational and encouraging to many Mormon writers and readers. So, I checked my local library to see which, if any, of the nominated books they carried to see if those aforementioned Miltons and Shakespeares had shown up yet. Fortunately, there are several of the Whitney finalists in the library system, though they were oddly weighted toward the YA categories. Anyway, I checked a whole stack of them out and have been indulging in far more fiction than usual over the past couple of weeks. Let's start with Brandon Sanderson's Steelheart. 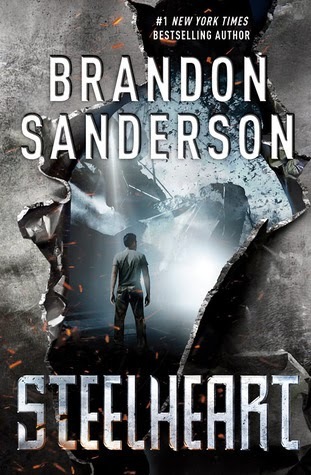 Many of my friends have been singing Sanderson's praises for years and I thoroughly enjoyed his humorous youth series Alcatraz and the Evil Librarians, so I had high hopes for Steelheart. I wasn't disappointed in the least. Sanderson has created a world set in the not-too-distant future that is populated with ordinary people just like us and then superhuman creatures called Epics. These Epics all started out as humans but their powers started to manifest when Calamity, a large red star-like orb that hangs perpetually in the sky, arrived - and no one is quite sure how. These powers vary widely from being able to create illusions, to becoming incorporeal and walking through walls, to invincibility. Each Epic also has an individual weakness, a closely guarded secret, as unique as his or her power. Unfortunately, Epics are not benevolent. A particularly powerful Epic named Steelheart conquers Chicago, redubbed "Newcago", and rules with an iron - er, steel - fist, instilling fear in the hearts of the citizens at every opportunity. He cannot be killed or even harmed, and has the ability to turn any inanimate object to steel. There is a shadowy group called the Reckoners, regular people who actively fight against the Epics, picking them off one by one, but for the most part people simply live in fear, trying to stay out of the Epics' way. David, an 18-year-old seeking revenge for his father's death at Steelheart's hands a decade earlier, joins the Reckoners after years of doing his own intelligence-gathering and study of the Epics. He brings valuable knowledge with him, knowledge that only he has: Steelheart can be hurt. David has seen him bleed. The story is gripping, a definite page-turner and the action never lets up. David is endearing, half awkward teenager and half determined avenger. His unintentionally mixed metaphors sprinkled liberally through the book are the perfect touch to lighten the mood when it starts to get just a bit too dark. The Reckoners David joins become a surrogate family, a tight team, and the relationships that develop are close and easy to believe. Prof, the leader of the Reckoners, becomes a father figure to the orphan David. So few dared resist the Epics. I'd watched children be murdered in front of their parents, with nobody brave enough to life a hand to try to stop it. Why would they try? They'd just be killed. He did it to me too, to an extent. I was here with him, but all I wanted to do was escape. You make us all selfish, I thought at Nightwielder. That's why I hate you. All of you. But Steelheart most of all. "Newcago is one of the best places in the Fractured States to live," Megan continued..."We should be focusing on Epics who aren't good administrators, places where life is worse." "No," Prof said, his voice sounding gruffer. "Because that's the problem!" he snapped. "Everyone talks about how great Newcago is. But it's not great, Megan. It's good by comparison only! Yes, there are worse places, but so long as this hellhole is considered ideal, we'll never get anywhere. We cannot let them convince us this is normal!" Fast-paced, engaging, great plot movement, interesting characters, there's a lot to love about the thoroughly enjoyable read that is Steelheart. The only downside here is that Steelheart is only the first book of a trilogy. The second book is scheduled to come out this fall, and the third in 2015. To quote Inigo Montoya: I hate waiting.